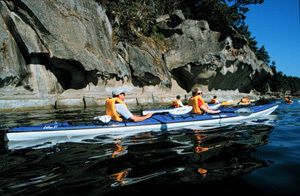 We provide sea kayaking day trips for groups up to 12 people. Trips are scheduled starting April 01 through to October 15. Other dates available upon request. The sea kayaking day tour starts at 9:00 am and finsihes between 3:00 - 4:00 pm. For groups or private trips, start and finish times can be customized to accommodate as necessary. Our North Gulf Islands day trip departs from the beach just minutes south of the city of Nanaimo on Vancouver Island, BC. No previous sea kayak touring experience is required to participate on this trip. The trip is suitable for active singles, couples and families. The trip is progressive in terms of skills and therefore is suitable for a variety of paddling abilities – beginners are welcome. While our trips are not considered to be strenuous or physically demanding, and we do not require a high level of fitness, good general physical condition is necessary. If you have any physical limitations or concerns please discuss with us. FUN! Included at no extra cost. Guests are responsible for their own transportation to and from the trip point of departure. If you do not have your own transportation, please contact us and we will make the arrangements for you. Please check with your health care plan administrator to ensure that you have sufficient coverage while participating on one of our tours. Pacific Northwest Expeditions is not responsible for any medical or evacuation costs should they be incurred for your safety or health during the course of the tour. Each trip participant will be required to sign a Pacific Northwest Expeditions ' Release of Liability, Waiver of Claims, Assumptions of Risk, & Indemnity Agreement’ and complete a ‘Medical Questionnaire Form’, prior to the trip departure date. Any trip participant under the age of 19 years will be required to have a legal guardian sign an Indemnity Agreement. To view these documents please visit Terms & Conditions. You will be provided with comprehensive information on suggested outdoor clothing for your trip. Your pre-trip information outlines suggested quantities to bring along to make your trip enjoyable for any weather conditions that could be encountered. Sun block for lips, nose, and ears. A good block is highly recommended as UV radiation is intensified from the reflection off the water. Teva like sandals or old pair of sneakers for paddling. Pair of light hikers or sneakers for on shore. Shorts (preferably quick dry material).